Support Hero’s Bridge in its mission to serve, standby, and honor veterans age 65 and older. 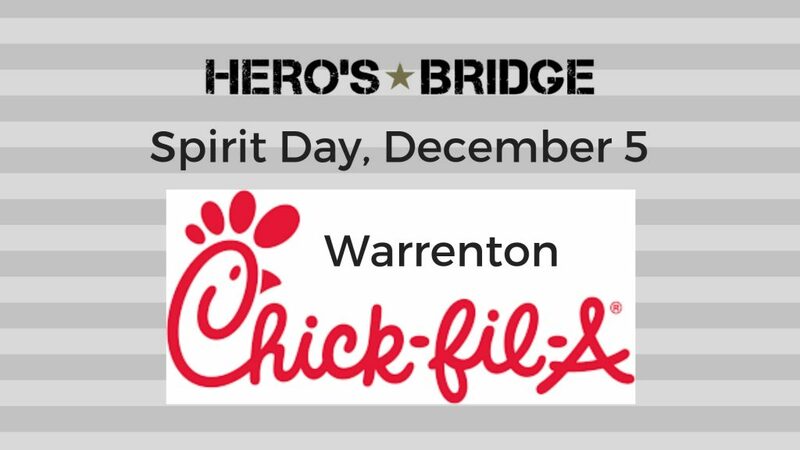 Chick-fil-A Warrenton is holding a Spirit Day for Hero’s Bridge, so stop in for breakfast, lunch, or dinner and let them know you here to support Hero’s Bridge. We look forward to being at the Spirit Day and will be there between 5 pm and 8 pm to answer any questions you may have on Hero’s Bridge and also if you wish to purchase raffle tickets for our “Line of Duty” artwork. Remember to let Chick-fil-A know you are there to support Hero’s Bridge when you order. Thank you for your continued support of our organization.